Really Tough New Year's Resolutions for Climate Scientists! A recent article in the SMH follows many in the same genre where arrogant warmists believe that those who disagree with them must have something fundamentally wrong with them. To err is human and we should forgive many their inability to constrain the draw of the emotions. But this failure is inexcusably egregious in our politicians who are steering the ship for the long voyage, not just around the next reef. Of course one must wonder what is wrong with the physicist/mathematician Freeman Dyson , a leading sceptic often called Einstein's successor who makes mental pygmies out of the scientists pushing the Global Warming scam. Canada is officially withdrawing from the Kyoto protocol because unlike his Australian counterpart, Julia Gillard, Stephen Harper is concerned about damaging the Canadian economy and the booming oil-sands industry. Canada has announced it is pulling out of the Kyoto Protocol on climate change. Environment Minister Peter Kent said on Monday that Canada was invoking the legal right to withdraw from the pact. Canada, joined by Japan and Russia, said last year it would not accept new Kyoto commitments, but renouncing the accord is another setback to the treaty concluded with much fanfare in 1997. No nation has formally renounced the protocol. Canada's previous Liberal government signed the accord but Prime Minister Stephen Harper Conservative government never embraced it. Mr Harper's government is reluctant to hurt Canada's booming oil sands sector. The move comes after about 190 nations, including some the world's biggest greenhouse gas emitters such as the US and China, agreed on a deal in Durban to develop a global pact for reducing emissions by 2015. The Kyoto Protocol, due to end in 2012, will be extended until a new agreement comes into force. Clash of green rip-off schemes - A battle of morons! The penny drops ! The Gillard government is moving to cut down the immensely stupid "rip-off-your-neighbour" solar panel feed-in schemes , not because of the soaring power costs to non-panel owners (most of us), but because it is interfering with her own federal "green rip-off" scheme. No sympathy is given to the electricity consumer who can but watch and wonder at this battle between morons ,because being screwed by a federal or a state body feels pretty much the same. THE Gillard government will demand the states curb expensive feed-in tariffs that pay households to generate electricity from roof-top solar panels, and review other green schemes that threaten to make the carbon market less efficient. The Australian can reveal that today's draft energy white paper will commit the government to working with the states to try to harmonise the feed-in tariffs so that they do not impose an "unjustifiable burden" on electricity consumers. The government is concerned that the feed-in tariffs are cross-subsidised through increased energy costs for those who cannot afford to install solar PV panels and that they are putting pressure on the federal small-scale renewable energy scheme, estimated to cost consumers $4.7 billion by mid-2020. The commonwealth will use the white paper - to be released by Resources Minister Martin Ferguson this morning - to push for a new agreement from all Australian governments for a review of more than 200 existing emissions-reductions policies that are often inconsistent and already cost more than Julia Gillard's proposed carbon tax. If direct financing is used Australia's share of the 100 billion dollar slush fund to be set up by the United Nohoper's organisation is between 2 to 3 billion dollars and the majority of the proposed recipients of our largesse are not democracies in any sense of the word. Aussie taxpayers will be incensed at this misuse of public funds. The legal architecture of a $100 billion-a-year Green Climate Fund will also be established to finance climate change adaptation for developing countries. Ultimately, financing the GCF will become the negotiating chip for rich countries to buy off support from poorer ones. Where the GCF's money is coming from remains unclear. If financing is direct, Australia's contribution is expected to be between $2bn and $3bn a year. Australia is unlikely to have to pay this because we will chuck the buggers out before then! 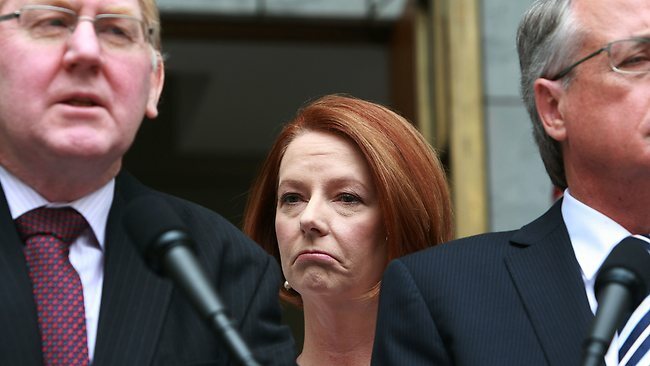 The previous opinion poll has turned out to be a false dawn for Julia Gillard as the latest polls resume their downward trend. with Abbott again now the preferred PM. Gillard used the previous poll to turn the heat up on Tony Abbott but the positions are reversed now. On current trends Labor would be massacred if an election were held now. The Climate ramora infesting Durban for the last 2 weeks can now return home on CO2-spewing jets to re-attach themselves to their respective hosts and start sucking! Only the EU has been silly enough to extend Kyoto and everyone else said it was too hard and we will have another nice meeting sometime in the future as long as we don't have to do anything now. Australia's Climate Fraud Minister gormless Greg Combet of course thought it was a terrific non-deal as he is desperately trying to justify having exposed his country to economic carbon tax pain expecting others to follow suit and he is feeling very lonely. The solar panel party is almost over as people are finally doing calculations that have been obvious to this writer and other skeptics and finding that paying ten times the real cost for energy is a recipe for disaster. Unfortunately when the music stops those with solar panels will still be ripping off their neighbours that don't have them. The Australian says that the Federal solar scheme will cost 4.7 billion by 2020 and that is a minor cost compared to the billions more in feed-in tariffs state governments impose that electricity users pay. Greg Combet is puffing himself up and threatening to withdraw from the next round of Kyoto playing tough like the big boys on the block which is ridiculous because unlike the others our Government has already assumed the position for the warmists with the carbon tax and really has nothing left to withdraw -the damage has already been done. Australia no longer has a dog in this particular fight thanks to Gillard and crew caving in to the Greens. It is not surprising that when a gaggle of government-funded lefties get together they would consider the solution to any problem facing them would be a new tax - just a tiny tax that would raise hundreds of billions of dollars and no one would notice. This brilliant idea is gaining traction amongst the mentally challenged chatterati who don't understand that there is no free lunch - you can't get something for nothing and in the end every depositor,super fund and bank user will pay for this. Of course we will need a complete new bureaucracy to supervise this and bank compliance costs will go up. A tax on financial transactions is iniquitous and non-productive . Of course the whole problem is exacerbated by the proposal to give these funds to a Green Climate Fund and we know how wise and careful they will be with these funds. The whole idea is so stupid the EU at least will probably adopt it! “The Green Climate Fund is very important for developing countries. Finding sources and channels to mobilise money into the fund is crucial,” said Director UN-II Mirza Salman Babar Beg, who is part of the negotiating team in Durban. The Financial Transaction Tax, also known as the Robin Hood tax, is a small levy of 0.01%-0.05% imposed on the trade of stocks, derivates, currency, and other financial instruments. Although different estimates have been proposed, global economists believe that potential revenues can range from $176 billion to $650 billion per year. These revenues can significantly contribute to the GCF, which will help developing countries to tackle poverty and climate change. It has also been proposed that the tax has the ability to discourage high frequency financial trading that causes big risks to the global economy. Global warming is not slowing down say researchers but is just being masked by all that snow, El Ninos, sun's brightness, volcanoes ,the kitchen sink and anything else that comes to mind. In fact anything rather than admit that the wheels have come off the global warming scam ! Lucia's graph shows the problem the warmist's have with their predictions (black) going north and the temperature going south. Amazing scientific discovery - the Arctic did not exist until discovered by satellite! Andrew Freedman of the Washington Post tells us that the last 5 years have seen the lowest summer ice areas in the SATELLITE ERA ie the last few decades. This ignores completely the retreat of arctic ice in the 1920's and documented accounts of similar melts in the 1800's. He does not explain how the current era differs from previous times. However he does have some really good news in that computer models predict an ice-free arctic by 2035 and given the accuracy of the models so far you can bet the Arctic is perfectly safe! Programmers refer to this as garbage in-garbage out programming and this especially seems to apply to climate models. Of course in line with the "everything bad is caused by CO2" theory he details the latest kooky theory to explain how global warming is causing all the winter snow in the last years which has become a major embarrassment to the true believers. The last five years have been the warmest recorded period in the Arctic and climate conditions over the Arctic cannot be ruled out as influencing weather in some sub-Arctic regions, making it relative colder for part of the winter. Polar Scientist: Antarctica is cooling and not melting. P Gosselin of the No Tricks Zone translates for us an interview with a veteran polar scientist who gives the lie to the usual warmist BS we are fed about the Antarctic! The video is in German for those who understand the language. Following the failure of a meaningful Durban agreement and in an effort to save face Australia, New Zealand and the EU have formalised negotiations for swapping paper carbon credits although I understand the mafia will have to ratify any EU decision given the amount of the market they control. Greg Combet is to have further talks in an indaba which is Zulu for "secret men's business" , a term Greg would be familiar with..The coming Aussie ETS is the ALP version of a free market with price controls to prevent the carbon indulgences becoming worthless when people realise their intrinsic value. Greg Combet is delusional when he says expanding trade in these bits of paper will be "good for economic growth" showing why Labor is regarded so poorly as an economic manager. The once-great Scientific American has the story of an "independent study" (whatever independent means) that has found that 74% of warming since the mid-fifties is man-made and that natural variability is only 26%. The article has the obligatory chimney stack spewing out smoke which I guess is meant to represent the colourless and odourless CO2 - the old SciAm would have known the difference.. Of the .5 degree rise since 1950 only .07 degrees has been attributed to the sun which I find odd considering a solar minimum caused the little Ice Age. Considering the "travesties" mentioned in the Climategate emails and the general confusion among emailers the improvement in accuracy of these recent studies is amazing - 74% implies an accurate calculation whereas 70 to 80% would be quite sloppy. The New Zealand ETS is serious trouble with the price of carbon credits in Europe destroying the local scheme. The whole theory that shuffling bits of paper will save the earth is now being seen as the scam it is. New Zealand units have halved in price from May this year and are now only $11 reflecting the European price, and the Government may have to ban international credits to prevent embarrassment. All the parasites lined up to engorge themselves on the fat Climate Change carcass are having second thoughts as the scam unravels. With the death of the Chicago Climate Exchange last year and the plummeting carbon prices in Europe life is going to get very hard for these unproductive freeloaders. Financial institutions are reducing resources in their Climate scam related departments as the world cools on Climate alarmism. Bishop Tutu is now a "Global Leader" according to the Puffington Post! The desperation the Warmista must be feeling with the Durban disintegration is shown in the Huffington rag where the latest news is that "Global leaders" are criticising Canada for showing some common sense. These "leaders" are a whole bunch of people the average person has never heard of apart from Bishop Tutu - the US,China and India are certainly not represented. While the 80 year old Bishop Tutu is a fine human being a world leader he is not! Canada's stand is a great encouragement for many other nations being bullied and represents a clear and present danger to the Climate scam , hence the hysterical reaction to it's dumping Kyoto. The Data the Climategate Conspirators wanted to hide! The graph above appends GISS post-1999 US temperatures (normalized to 1998) on to their 1999 version of the temperature graph. As you can see, US temperatures have declined over the last 80 years. The climategate 2.0 E-mails tell us that the DOE doesn’t want the raw temperature data available to the public. Here is why – they now publish only data which has had 0.6F degrees added on to recent temperatures, and about 0.1F degrees subtracted from older temperatures. The graph below alternates between the 1999 GISS graph and the current version. It shows the spectacular cheating going on – which DOE doesn’t want you to see. The Minnesotans for Global Warming are on the ball with a movie trailer on Climategate 2. The Canadian Government is showing large cojones in standing up to the attacks in Durban by the Climate ignorati. Canada is now being made a whipping boy while the 40% emitters China and the US are doing nothing ,because it is easier to make poor old Canada a target and scapegoat than to offend the large nations. . Good on you Canada! The NSW Dept of Climate Change and Water has been caught out with it's own "hide the decline" moment , preventing publication of peer-reviewed papers showing sea level rises of only 1mm per year giving the lie to the Warmists scare of "accelerating "sea level rises. Fort Denison sea level data shows that over 120 years sea level is rising at only 1mm per year or 100 mm by 2100 contrary to the scare campaigns of Tim Flannery and his ilk. As NSW now has a Coalition Government it will be interesting to see how they handle the situation! Sea levels measured by the Envisat satellite show global levels have stopped rising over the past 5 years.